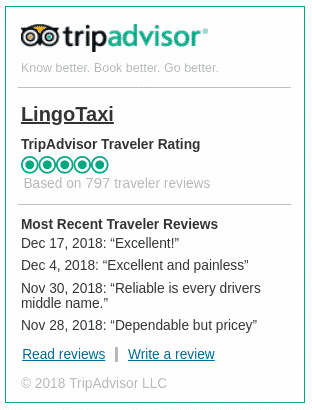 On this page, customers of LingoTaxi are able to share a review of their experience with our services. If you have been one of our customers, you are welcome to leave your feedback in the form below, on our Google page or if you feel like, on TripAdvisor. Thank you very much for your trust in our company. Everything was perfect for our transfer from the center of St Petersbourg to the Pulkovo airport and our driver was very kind !